Takato Castle (高遠城) is hilltop castle located in Ina, Nagano. It is also well known for its Sakura, today. It was the castle of Takato clan which is the brunch of Suwa clan. Takeda Katsuyori the son of Takeda Shingen ruled this castle during the Sengoku Period. In 1547, Yamamoto Kansuke and Akiyama Nobutomo extended this castle to current size. Today, the baileys, dry moats are remains in good condition. 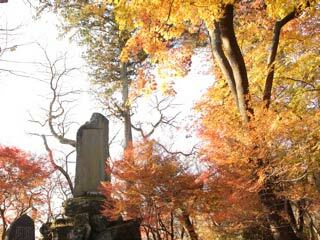 In fall, it has also beautiful autumn leaves. In Sakura season, there is an admission free for the park. It was used to be the castle of Takato clan, the brunch of Suwa clan. In 1545, Takeda Shingen defeated and take over this castle. Yamamoto Kansuke and Akiyama Nobutomo extended this castle in 1547. Those construction of Kansuke still remains in this castle as Kansuke Kuruwa. In 1562, Takeda Katsuyori became the lord of Takato Castle. When Katsuyori became the successor of Takeda clan and moved to Tsutsujigasaki House, Takeda Nobukado, the brother of Shingen, became the lord of this castle. In 1582, Oda Nobunaga ordered his son Nobutada to attack this castle. Nobutada brought 50,000 of army and surrounded Takato Castle. This castle fought until all soldiers' death. Only soldiers of Takato Castle fought against Nobutada, and lest of Takeda samurai betrayed Katsuyori and Takeda clan. After the incident at Honnoji, Ieyasu took over this castle and all Shinano. During the Edo period, Naito clan became the lord of Takato until the end of Edo period. Today, it is chosen as one of 100 best castle of Japan. ... is a keep with the drum. During the Edo Period, drum was the time chime for this area.